A plant-based dessert without compromise. At Nora's, we believe that plant-based ice cream should feel like a treat, not a sacrifice. We use house-blended cashew cream to create a ridiculously creamy ice cream that's as good as the stuff you remember from when you were a kid. With classic flavour profiles and short, recognizable whole food ingredients, you won’t miss dairy one bit. All of our ice cream is made in small batches in Vancouver, BC. Certified Vegan and no artificial colours or flavours, ever. It really should be called Mmmmint Chip. Made with pure peppermint and flecks of rich dark chocolate, there’s a reason why people say this is their all-time favourite. We reunited good buddies, Peanut Butter and Chocolate. With a creamy peanut butter base, chunks of dark chocolate, peanuts, and a pinch of sea salt, it’s next level. This vanilla is anything but ‘vanilla’. Creamy cashew milk and real vanilla beans come together in every blissful bite. Rich strawberry purée blended into our classic Vanilla Bean base. We have to hand it to her, Mother Nature really helped us out with this tasty treat. 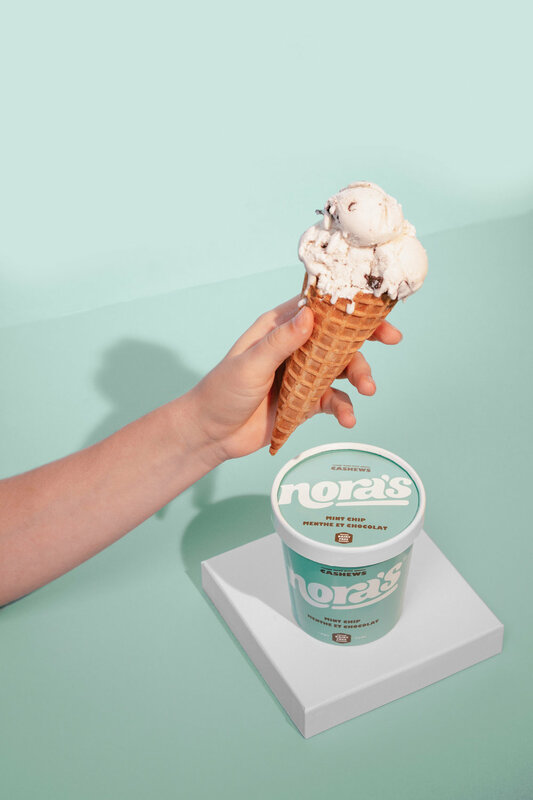 Nora’s was founded in Vancouver, BC by two ice cream lovers who adopted a plant-based diet and could no longer find an ice cream they loved. Motivated to be part of the plant-based food movement and to support others looking to incorporate more plants into their diets, they decided to start recipe testing in their home kitchen with a tiny Cuisinart ice cream machine and a whole lot of cashews. Ten months later, Nora’s was on shelves around Vancouver! All of Nora’s pints continue to be handmade in Vancouver with no artificial colours, flavours, fillers, preservatives, or animal by-products (ever). Click here to order Nora's to your home via SPUD!